High tie and stripping is performed to treat venous reflux at either the long (LSV) or short saphenous vein (SSV). The procedure tends to only be undertaken if the patient is unsuitable for endovenous ablation, which may be due to the size of the vein (too large), tortuosity (making cannulation and wire manipulation difficult) or superficial nature of the vein. It is performed through a 2-3 cm groin crease incision at the LSV, the vein is tied off at the junction of the deep vein, and stripped down the leg. Direct stab punctures to remove additional tortuous varicosities in the lower leg are then undertaken. 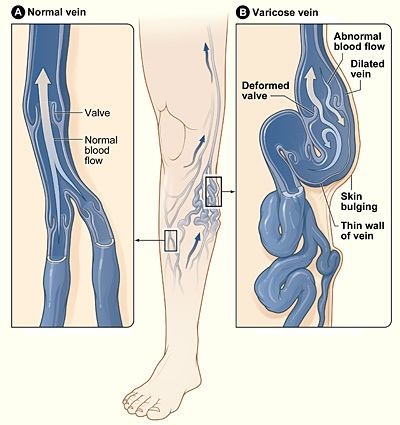 Haemorrhage This can occur due to damage to either the femoral artery or the femoral vein or its branches, and may require blood transfusion, although this is extremely rare in varicose vein surgery. Injury to surrounding structures The femoral artery and femoral vein are adjacent to the LSV and can become damaged. The sural nerve is close to the SSV and can become damaged during dissection. Pain There will be minimal pain with this procedure, requiring simple analgesia only. Nerve Injury In approximately 5% of patients, sensation in the top or outer border of the foot may be damaged due to local nerve damage. Seroma A swelling of lymphatic fluid may occur in the abdomen due to disruption of the lymph nodes and channels. Careful dissection of the lymphatic nodes and channels with ligation will minimise this risk. Reintervention Varicose veins are often recurrent, with treatment of one segment later leading to varicose changes in another branch of the venous tree.